I got many mails about to post cakes made without oven. So i was waiting to try those cakes made without oven. When i was at my mothers home i got a chance to bake this cake. I was super excited till i remove the cake from pan and tasted it. I really wondered about the outcome. Now i have to say there is not much difference in the taste of the cake. I used the ingredients which are available in kitchen pantry to make this cake except soda powder and baking powder. I used oil instead of butter. For greasing i used ghee you can use oil too for greasing. I used spoon instead of wire whisk. I used 18 cm vegetables cooking pan inside pressure cooker to make this cake. Even then it was really yummy and the outcome was really satisfying. People those does not have oven at home also make this cake on stove top. So simple to make and easy too. Super tasty cake without much effort. 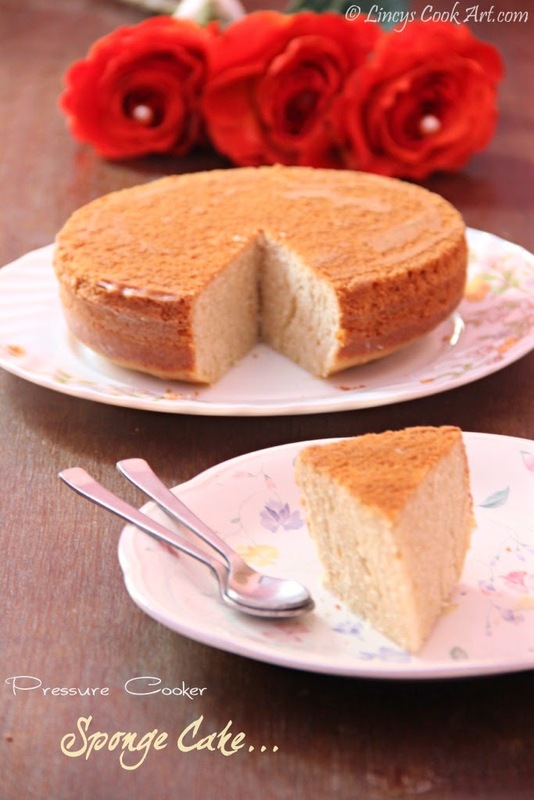 You can surprise your family members by making this cake using pressure cooker. Add the oil and beat well. then add the milk. Sift/ Sieve the All purpose flour with Baking soda and Baking powder together. If the batter is thick add a tablespoon or two of milk and get little thick but pouring consistency. Grease the cake pan with butter or ghee. Sprinkle tablespoon of flour and tap the pan to stick all over the pan. Do not spread the flour with hands. Transfer the whole batter to the greased pan and flatten the surface. Sprinkle some chopped nuts like cashews, almonds or pistachio on top if you wish for extra taste. Close the pressure cooker with the lid without gasket, do not keep the whistle on top and keep the flame to little above the sim (medium) and cook the cake. Now open the cooker and check whether it is done or not. If it is not done close the lid and cook till the skewer/ knife inserted comes out clean. The cake batter should not stick to the skewer/ knife. If inserted knife shows runny cake batter, your cake will take more time to cook. If it is sticking slightly it will take 5-10 minutes to cook. Once cooked skewer/ Knife will go inside like you inserted knife inside a sponge and comes out clean without any crumbs. It took for me about forty five minutes to cook the cake. Be careful while transfer the cake pan tot he pressure cooker and while removing from it (Cooker will be so hot so i used holder to keep the batter inside and remove the cake). Replace eggs with yogurt to make egg less cake for vegetarians and health watchers. I love pressure cooker cakes I have made chocolate cakes in cooker before...yours look lovely..
Like the stove top version ....... Cake come out nice and soft!! Omg, wish i could make the pressure cooker cake as much as prefect like u.
Wow! I never would have dreamed of making a cake in the pressure cooker! I'm eager to try this out! nice... i loved doing it.. I am eager to try your recipe, i checked all the stores but couldnt get baking soda , what can i use as substitute. If you ask any grocery store you will get it. Normal soda powder is enough. You are from which part? so that i could help you out. If you dnt get use plain soda drink with out any flavour instead of milk. Or add 2-3 tablespoons of cornflour with the all purpose flour|maida.